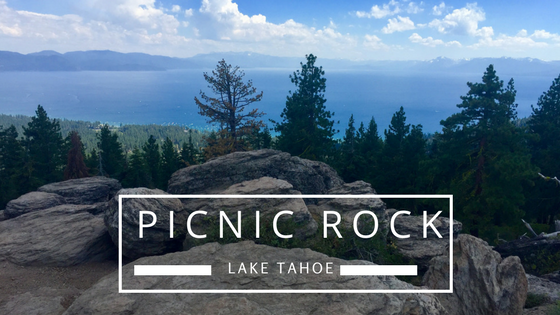 Picnic Rock is one of my favorite hikes in North Lake Tahoe for the epic views and peaceful rock outcropping at the top. 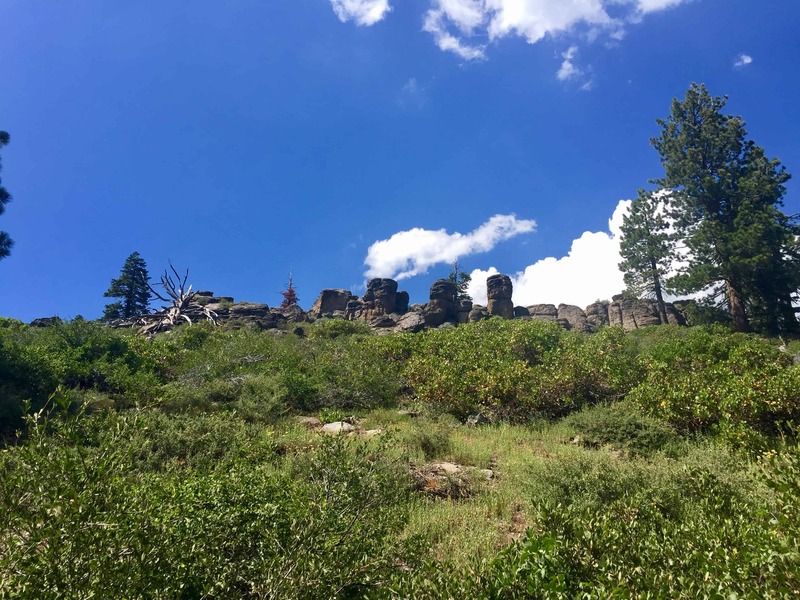 This family friendly hike is great for kids and visitors because it’s shaded, only 1.5 miles to the top and offers great views every step of the way. 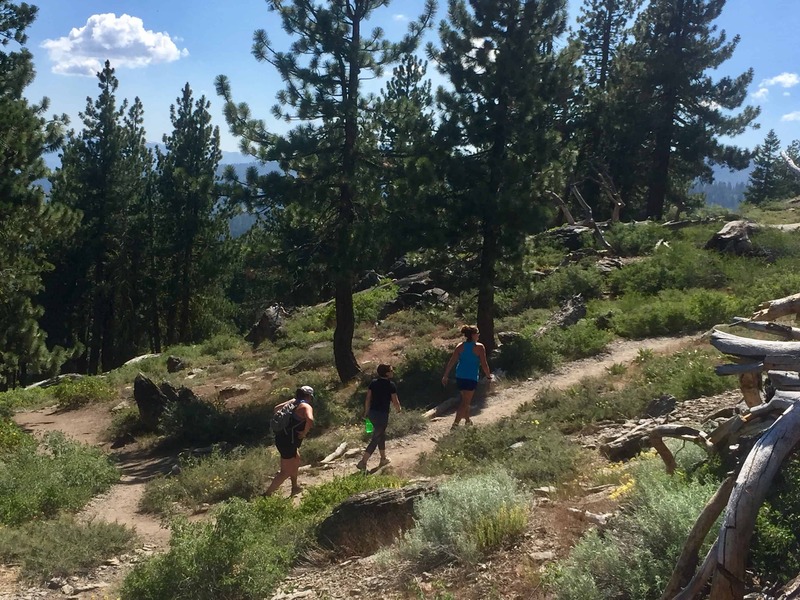 The trail follows the famous Tahoe Rim Trail which is 165 miles long and circumnavigates Lake Tahoe. Getting there: The trailhead for Picnic Rock Viewpoint is located on Highway 267 between Truckee and Kings Beach in North Lake Tahoe. 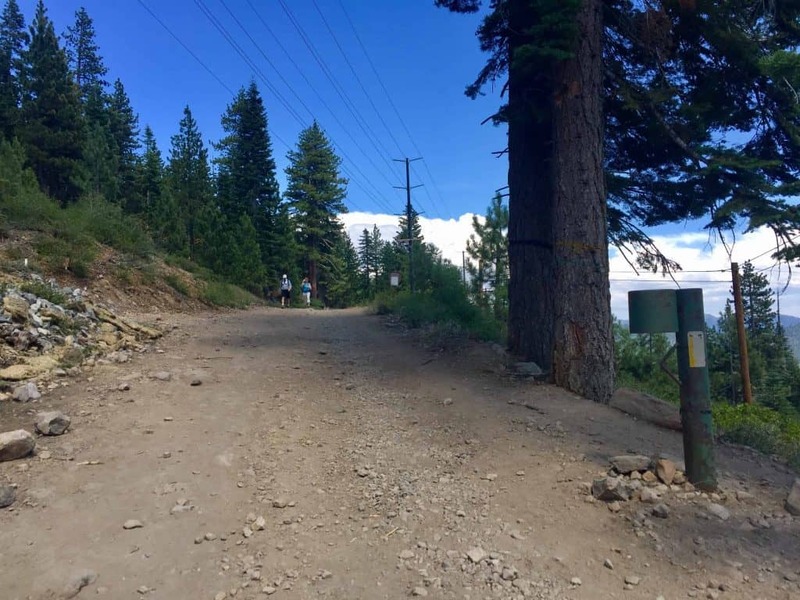 It’s closer to Kings Beach than Truckee and is up the hill past Northstar. 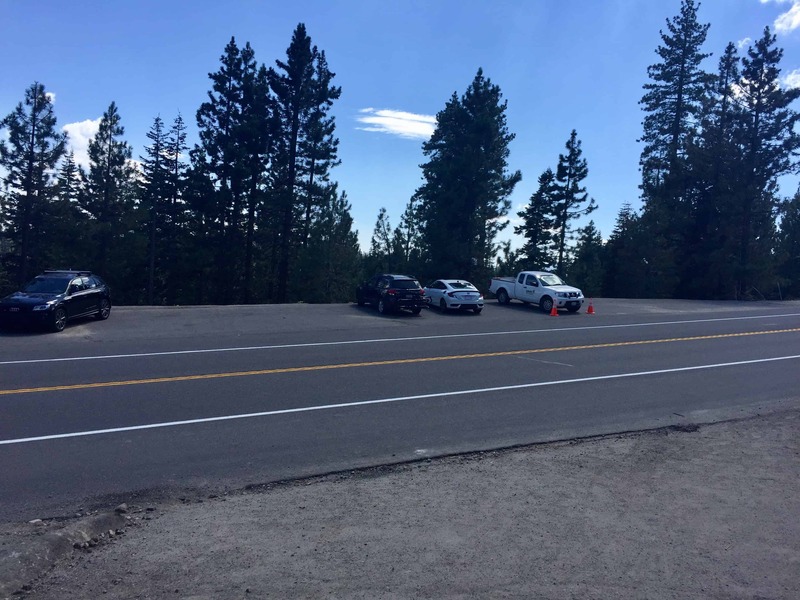 Coming from Kings Beach drive about 3 miles up Hwy 267 and the parking area will be on your left. From the traffic light at Northstar Drive it’s just under 4 miles and the parking will be on your right. It’s more of a pullout than a parking lot. Parking: Park vertically in the pullout to allow room for others (front in). If the pullout is full you can park on the shoulder of Hwy 267 or if you have 4WD you can pull up the dirt road on the east side of the road, across from the parking area. Dirt access road to the trailhead. Trail Description: Walk across Hwy 267 and hike up the dirt road. 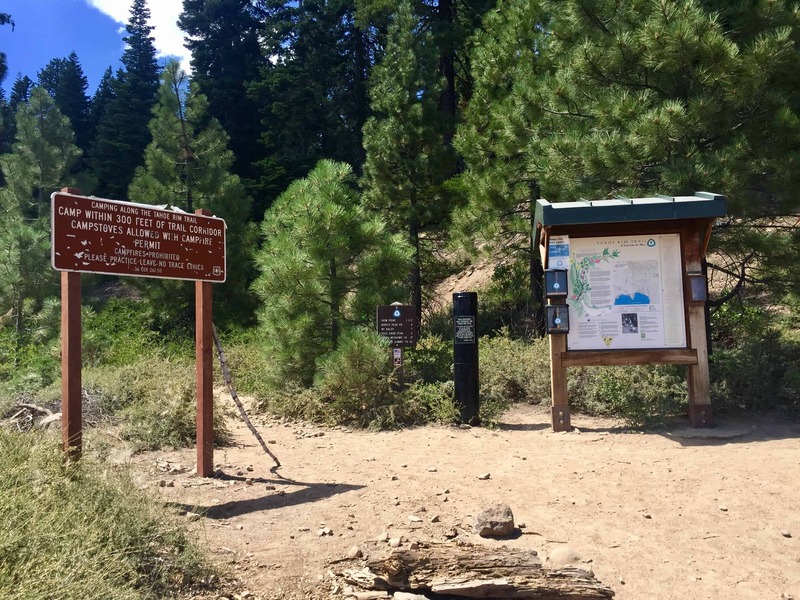 It’s very short then you will see the sign for the Tahoe Rim Trail along with a trail map and trail information. This is the actual start of the hike. Start of the trail with map and information. 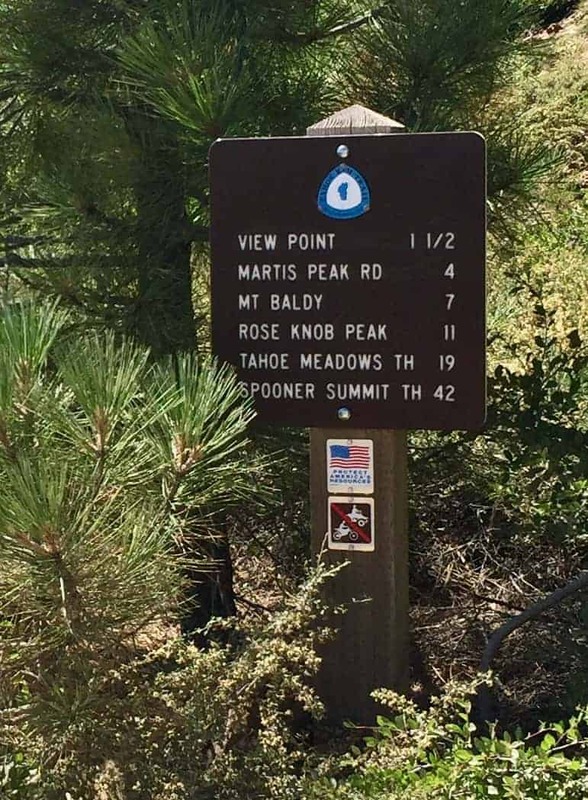 There are many hiking options from this trailhead and you can choose to go as many miles as you like. 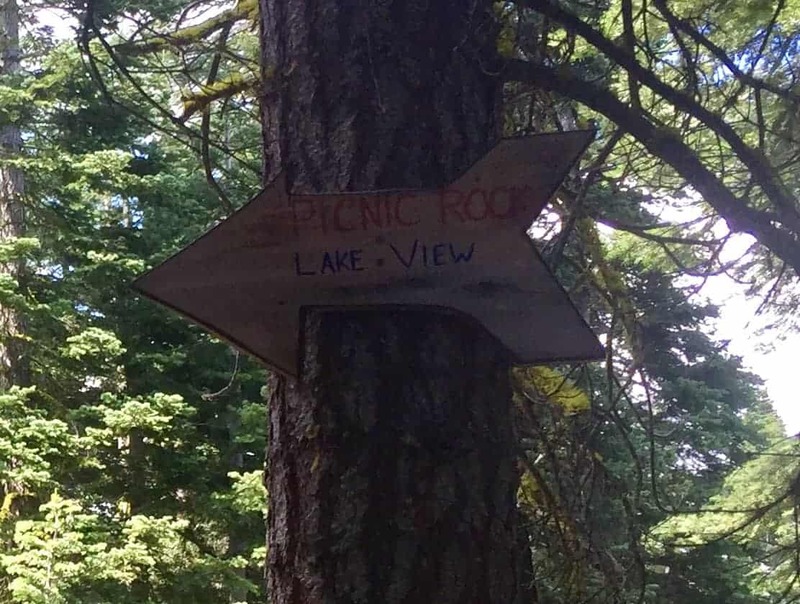 You could even go all the way around the Lake, although that takes a lot of time and planning. 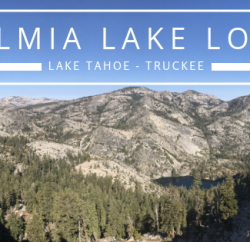 Check out Tahoe Rim Trail Association if you are interested in learning more about hiking around Lake Tahoe. Here’s the mileage for different destinations along the trail. 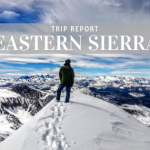 This post is focused on the Viewpoint which is 1 1/2 miles. 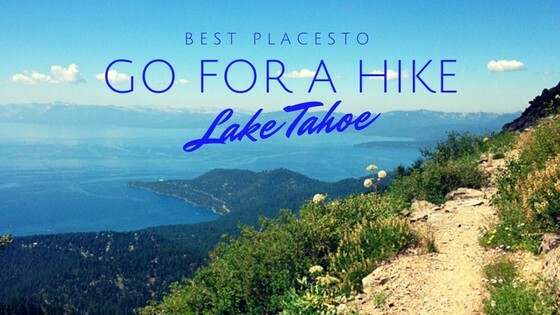 So many options depending on how far you want to hike! The trail is singletrack and relatively smooth. 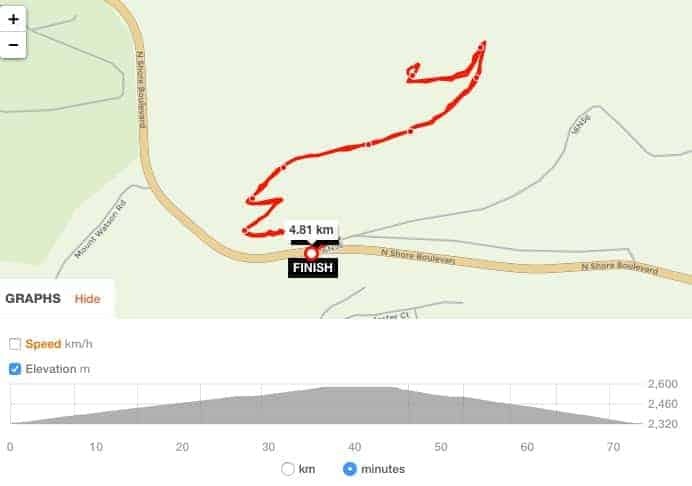 It’s does climb up about 830 feet over the 1.5 miles so be prepared for some climbing and switchbacks. The switchbacks are nice because that keeps the trail from feeling too steep and you can keep up a decent pace. There are lake and mountain views right away to keep you inspired. 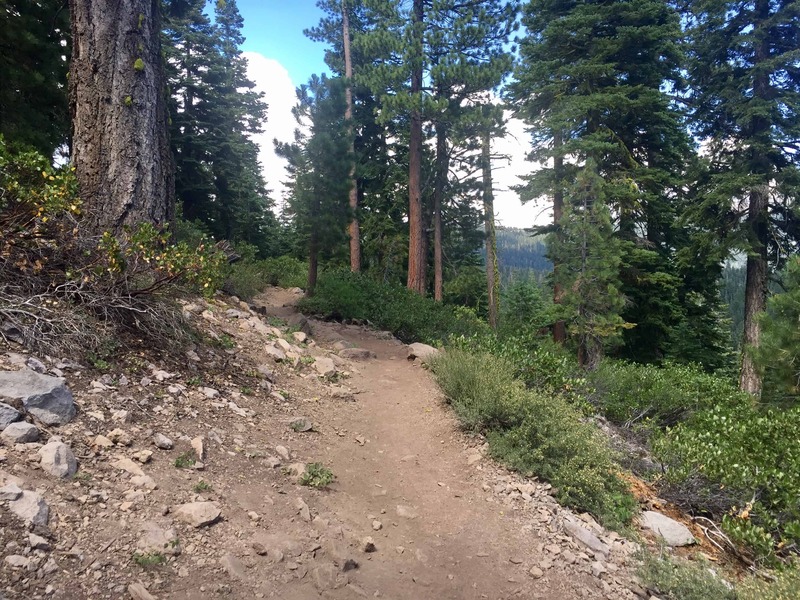 This trail goes through the Tahoe National Forest and is relatively shady which is nice on hot summer days. There isn’t any water along the trail so make sure you bring something to drink for yourself and any furry friends joining you. The trail is smooth and shady. 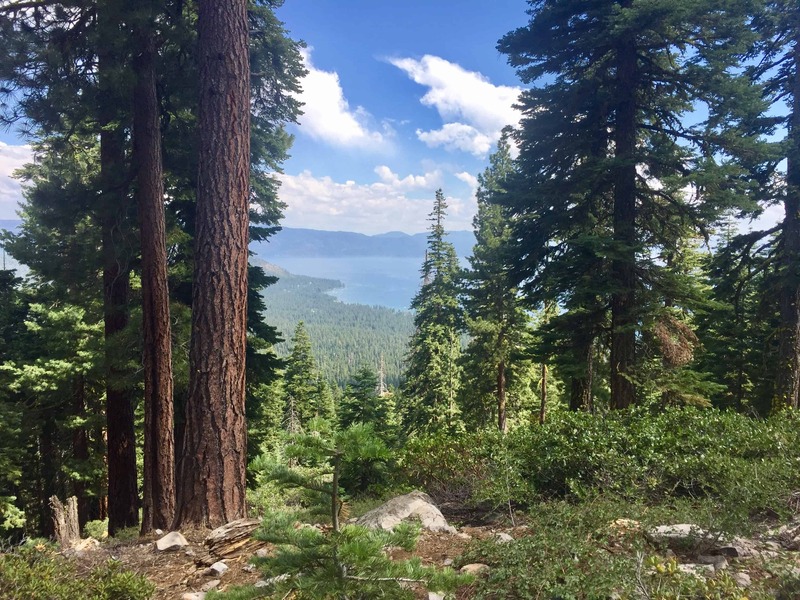 Peek of Lake Tahoe from the trail. After a little over a mile you will come to an intersection in the trail. There will be a trail going up to your left, this is where you leave the Tahoe Rim Trail to hike up to the Viewpoint. There is a arrow shaped sign on a tree signaling the turn. At this point you are almost there! Don’t miss the turn for the viewpoint. The trail gets a bit steeper here but it’s short so push through it! 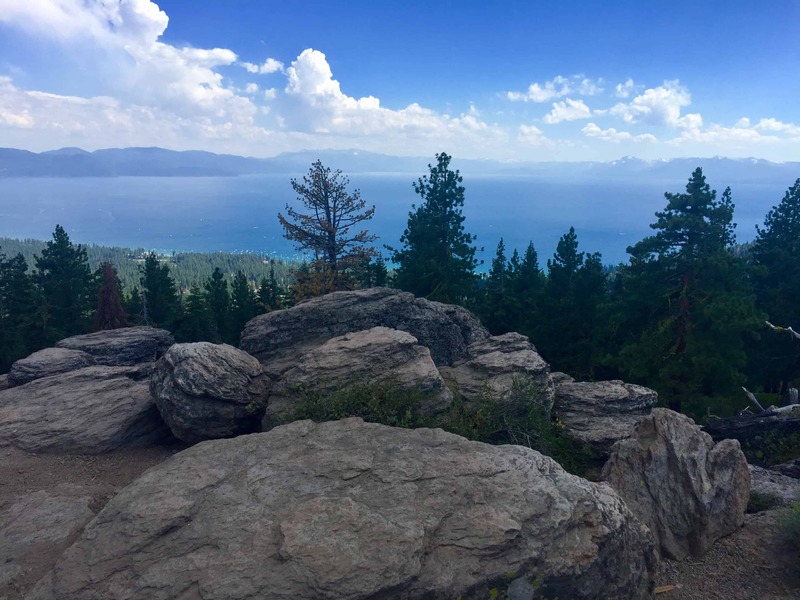 About 1/4 mile up you will see the rock outcropping on your right and a panoramic view of Lake Tahoe on your left. 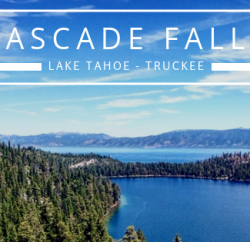 From the top of the rocks you’ll have a 365 degree view of Lake Tahoe all the way to Truckee. View from the top. It’s even better in person. Yeah, we made it! Make sure you bring your camera. 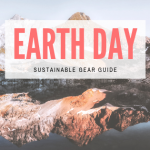 My hiking kit includes affiliate links to purchase these items online or you can come into Tahoe Mountain Sports to get your perfect hiking kit! 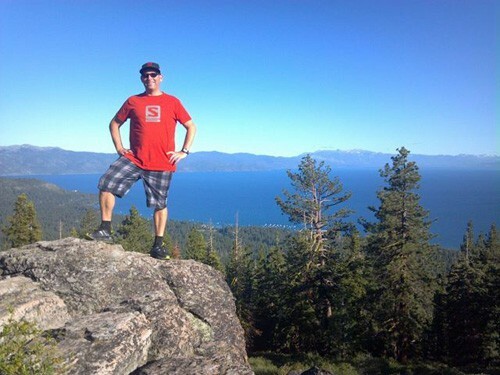 Hydration and Fuel: I used the Camelbak Palos 4 LR Hydration Waist Pack. I like this pack because I broke my collarbone a year ago and now I don’t like having a strap go across my clavicle. The Palos pack is very comfortable and fits everything I need for a long day on the trail. I didn’t use a hydration bladder. I had 2 Salomon handheld bottles inside the pack along with some Epic bars and Clif Shot Bloks. I like the combo of the sweet gummies and the meat bars. This combination of energy foods keeps me going all day. 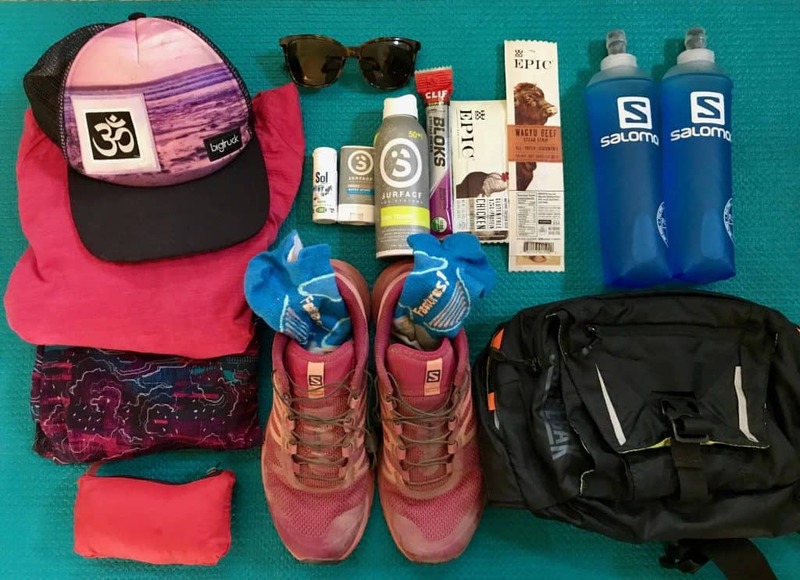 Check out this post on How to Fuel Your Adventure for tips on which energy foods might work best for you. Shoes: I’m loving the Women’s Salomon Sense Ride Trail Running Shoes! They are lightweight, and grippy on all different surfaces including wet and snowy trails and rocks. They have an aggressive tread and provide good support with ample cushioning. I’m psyched on this new shoe by Salomon. Here’s the link for the men’s Salmon Sense Ride Trail Shoe. Click here to read about the Best Trail Running Shoes for 2017 and the Best Hiking Shoes for 2017 to see which shoes might be best for you. Sunscreen: I’m a huge fan of Sol Sunscreen. I’ve been using it for many years now and it works well on long days, wet days, and doesn’t run into my eyes as I sweat and make them burn. I like the way it feels. It isn’t too thick or greasy or sticky. It’s just right. And a little bit goes a long way so it’s worth the price. I also recently discovered Surface Sunscreen. I found it because I was searching for a spray so I can apply sunscreen to my back myself. I love the way the Surface Dry spray goes on and feels. It’s amazingly light and airy, no runny drips. It stays on all day and provides excellent sun protection. I use it on my daughter for all day summer camp and on my arms and back when biking, hiking, swimming and paddling. Hiking Apparel: I like to switch it up depending on the weather. I usually hike in capris or shorts. I like the capris to be bright colors and have a pocket on the side for a phone. I’m a fan of merino wool and am usually wearing something from Icebreaker. 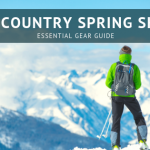 We have a great selection of hiking clothing including hiking pants for colder weather and travel at our store. I recommend having good hiking socks, I prefer a thinner sock so my foot doesn’t get too hot. A packlight jacket, I always have the Patagonia Houdini in my pack. 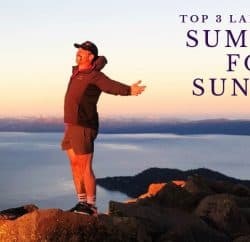 Click here to read about more hikes you can do in Lake Tahoe and share your favorite hike in the comments below!